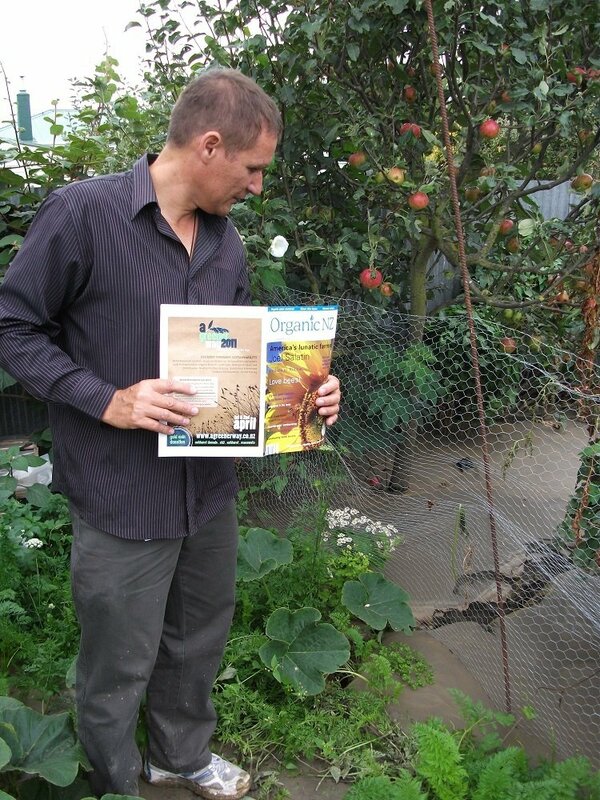 Tremane Barr in his vege garden after the February 2011 earthquake. His copy of Organic NZ arrived in the mail a few hours before the quake. The Canterbury earthquakes of 2010 and 2011 have shaken the lives and properties of many that live here, but one aftershock that has come as a complete surprise to the public was the release of information by the regional council – Environment Canterbury (ECAN) – that at least 11,000 properties might have some form of toxic contamination. These properties zoned ‘hazardous activities and industry land’ (HAIL) need to be tested to ensure the soil does not contain dangerously high levels of heavy metals and/or other hazardous chemicals. This public notification of HAIL-zoned land was speeded up due to the rebuilding process because workers’ health was being put at risk by coming into contact with contaminated soil. It is not acceptable that the Ministry for the Environment and ECAN had known for at least 20 years about the risks from these types of contaminants on properties and had not bothered to inform the public in Canterbury or anywhere else in New Zealand before now. We bought a quarter-acre section in 1994 for the express purpose of organically growing our own vegetables, herbs and fruit to be as self-sufficient as possible while raising our children. Our own chickens supplied all the eggs we needed. The 2011 earthquakes left us with major land damage and liquefaction, which ultimately necessitated our house having to be rebuilt. Unfortunately, we got the shock of our lives in May of this year, when we were told that soil tests taken around the house as part of the rebuild process had found levels of lead above the residential limit. We checked the ECAN Listed Land Use Register website http://www.llur.ecan.govt.nz/ and saw a photo showing that just prior to subdivision in the mid-1940s our property had been part of a market garden area with a glasshouse and orchard on it. The high lead level most likely came from paint used on the glasshouse, and lead arsenate insecticide still persisting in the soil after 70 years. Ironically the soil tests were not done until after the house site had had its soil dug out and removed, thereby exposing the workers to this contaminated soil. It also turned out our property was not one of the designated HAIL properties, as they missed identifying the historical market garden use of this site. This goes to show that ECAN, like other regional councils, will not always know exactly where historical toxic polluting activities have occurred. By this time the alarm bells had really started to go off for us as I have been diagnosed with pancreatic cancer, and had based my diet on leafy green vegetables and brassicas from our garden. We had extensive soil testing undertaken of our garden area using a hand-held XRF machine by Geoscience Consulting, which uses x-rays to provide instant feedback on the heavy metal content in soils, as well as soil and plant matter tests conducted by Hill Laboratories. The combined soil tests showed that overall lead levels were at 224 mg/kg compared to the acceptable residential limit of 210 mg/kg. This limit is based on the assumption that only 10% of one’s vegetable intake would come from a contaminated area like this and yet our consumption rate was closer to 100%. The testing of the silverbeet, carrot and celery plant material also showed that these plants had taken up dangerously high levels of lead. These vegetable test results contradict information given to the public by ECAN and the Ministry for the Environment that so long as you thoroughly wash vegetables grown on contaminated ground then they would be safe for eating. This rather shook me as all the literature I had read to that point conveyed the idea that the use of compost and lime over time would dilute and inhibit the uptake of heavy metals by vegetable plants. This is clearly not the case, as over 20 years I had put copious amounts of organic compost (and dolomite lime) on the garden, and yet still the soil and vegetables contain toxic amounts of lead. Indeed I have now found out that the very leafy green vegetables I have been relying on to help me overcome cancer are the most prone to uptake of heavy metals e.g. silverbeet, kale, spinach, lettuce and broccoli. This latest news is very disturbing because there is a known connection between people who have cancer and heavy metals in their bodies, and specifically a higher risk of pancreatic cancer with higher levels of arsenic, cadmium and lead. ECAN are informing the public that there is nothing to be worried about, yet in their own literature given to GPs they list heavy metals like lead as carcinogenic. While we have known for some time that it is no longer true that New Zealand is clean and green, the public now needs to know that we live in a contaminated country. One can no longer take for granted that the soil we grow food in is necessarily safe to do so, or that it is safe for children to play in the dirt of one’s own property. School programmes promoting vegetable gardening also need to have their soil tested. All the regional councils should come clean and tell the public about what they do know about HAIL properties in their regions, even if the information they have is imperfect. I have heard that Wellington and Auckland regional councils were also going to inform the public this year of the HAIL properties in their regions, but have decided to wait until after the election. If one has any doubts as to the potential for toxic activity on one’s property in the past I can only recommend that for peace of mind it is best to have the soil tested rather than have regrets later on. We also tested for arsenic, cadmium, chromium, copper, nickel and zinc. While levels of these were below the MfE MRLs, nearly 100% of our veges were coming from our garden – way more than 10%. All these results were well over the MfE tolerable daily intake. Tremane Barr (Ngāi Tahu/Kāti Mahaki ki Makaawhio) lives in Christchurch and works for Te Rūnanga o Ngāi Tahu on the Pātaka Mātauraka Pūtaiao (NZ Sustainability Dashboard Project).